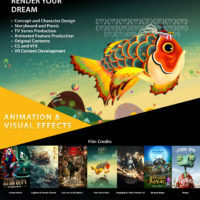 Home / Companies / The Monk Studios Co., Ltd.
“The Monk Studio” is an award winning Animation and Visual Effects Studio located in Bangkok, Thailand. We are currenly in production of 2 Animated Feature films of our own IPs, titled "SILK ROAD" and "Monkey Ganster", as well as providing service work for Animated Features, TV series Animation and Visual Effect films. Our clients list includes DreamWorks Animation, ILM, Alibaba Pictures, LucasFilm among others. With the team of 150 artists, we welcomes all jobs big or small.